The Fachhochschule Schwaebisch Hall, University of Applied Sciences of Schwaebisch Hall, Germany is a private Institution with full governmental accreditation. At present the University of Schwaebisch Hall offers two study courses: Culture Design and Media Design both finalizing with the international bachelor degree. Nearly 160 students are coached by ten (full- and part-time) professors and twenty specialized instructors. This provides a favorable student-teacher ratio of learners and instructors, making an intense professional exchange possible. Unlike large impersonal universities, there is a familiar and personal climate for education. The clear and manageable course structures help students to approach their studies with success. There are two principle aspects that make the studies at the University of Schwaebisch Hall an interesting choice: its partner-firm concept; and its explicit international orientation. The partner-firm concept provides the student the opportunity to gain practical experience through one of the university's partner companies. Through this program, every student attends one of the University's partner companies one day per week and at least one full semester in the course of study. This concept is highly innovative and successful. And this is why the University of Schwaebisch Hall has been honored in 2003 by the highly respected “Oskar Stiftung”, a foundation for Midrange Enterprises. Notably, it is the only academic institution to have ever received this honor. The international orientation is distinctive in its close relationship and exchange with a variety of international academic institutions and experts from all over the globe. All students from the Fachhochschule have the opportunity to study abroad for a full semester at one of the University's partner institutions on an exchange basis. The study abroad program is a curricular requirement for all Media Design students and an option for the Culture Design students. 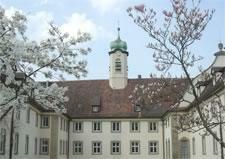 The University of Schwaebisch Hall cooperates with more than 160 professional partner companies and cultural institutions. For the student, this opens doors of opportunity that are normally closed, establishes important professional contacts, and expands the student's vision of the possibilities of their future career. Presently, there are two programs of study: Cultural Design and Media Design, the former being a study of studio fine arts, arts marketing and cultural manage-ment, and the latter comprising the fields of media arts, digital technology and applied media design. Common to both are integrated practical compo-nents: Both programs require one full-time internship semester, plus, over the entire duration of the curriculum (minimum of seven semesters), one full day per week working on applied professional projects in one of the school’s partner firms or partner institutions. Common to both programs is also an international component. There are various opportunities for one semester of study abroad, optional in the case of Cultural Design and manda-tory in the case of Media Design. The latter also has a large proportion of instruction in the English language (30-40%) on location in Schwae-bisch Hall, several instructors are bilingual or native speaker Americans. For this reason, Media Design is the primary department for placing exchange students from the mobility program at MICA.